Tackling poverty and bringing hope weren’t on the agenda when representatives of the Sussex-based charity, the Quicken Trust, first went to Kabubbu in rural Uganda in February 1999. The visit was one of many to villages in the area. But Kabubbu made a lasting impression. The villagers of Kabubbu had no clean water supply, no electricity and no access to education or health care. 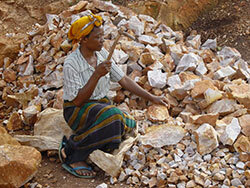 They lived in poverty and destitution, surviving on subsistence farming and casual work breaking stones in a quarry. This job was done by women. They were paid £2.50 a week. 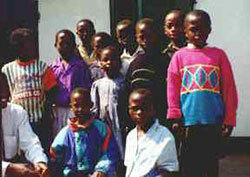 Many children had been left orphaned by AIDS or malaria. The villagers saw themselves as “The Forgotten People”. The Quicken Trust returned to the UK full of questions but feeling powerless to help. Later they decided to carry out some research among social workers, pastors, teachers and health professionals in Uganda. Then, in Spring 2000, Geoff and Geraldine returned, accompanied by a social worker and an experienced teacher. They also took 300kg of goods including basic medicines, schoolbooks, toys, clothes, video projection equipment and a portable generator. But the main aim was research. The group visited schools, a health centre and a prison. They talked to community leaders, health experts and government ministers. Geoff and Geraldine had also asked a local pastor to gather community leaders and 12 orphans to discuss what could be done. The Bookers were shocked by the response. More than 400 children turned up – many were orphans: a sea of faces — all in desperate need. Kabubbu’s elders were delighted. The pastor told them that in 1930 Christian missionaries had established a clinic in the village. But by 1935 they had left and it had shut. Local folklore had it that Kabubbu’s fortunes would revive when white people returned to help them. Asked to prioritise their needs, the village elders agreed the 400 orphans should be helped first. But the Quicken team explained they had no resources to build a school. They promised only to return to the UK, sell some handicrafts on behalf of the villagers and tell their story if they were asked. Any money they were given would be sent to Kabubbu. Back in the UK, Geoff and Geraldine discovered Kabubbu’s plight touched people’s hearts. Again and again they were asked to tell the village’s story. Many of those who listened were keen to give money. 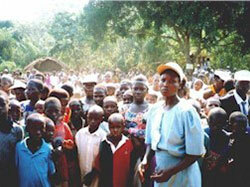 Within six months, 20 orphans in Kabubbu were being sponsored through the Quicken Trust. It meant they were taken to a school six miles away every day. They also received food, medicine and a uniform.